Hey! 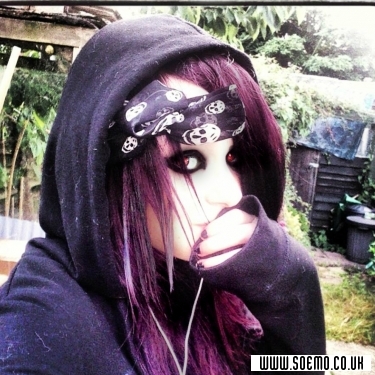 im Rowena, im a simple emo girl ^u^. MY BAND IS CALLED DEATH BY TEARDROP. I go to quite a nice accepting school, (but yeah, I still get hate, not that great :P). I have some awesome mates :D! im also in a band!!! im the singer xD, I'd like to think of myself as a member of BVB just less awesome and much less popular xDD. I love cute things and disturbing things!!! im a huge fan of anything dark :D.
My favourite colours are black & purple :D! I love kittehs, dogs, pandas, zebras and most likely every animal :D.
I hate exams 3: but I like the way you dont do much of the lesson :3. I love south park and all those programs :'D! I always love meeting new friends and stuff, and I am always friendly to them :). And other fellow emos :).